Canon and Savin offer state-of-the-art large-format printing solutions designed with exceptional speed, flexibility and quality. No doubt about it, they have a large format solution to fit your needs. 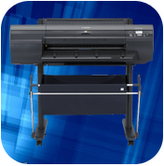 Included are many technological advances as well as workflow printing software.